Persian Yoga & Martial Arts Conditioning. 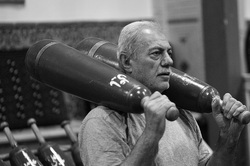 A total fitness conditioning system developed by Persians to forge elite warriors. The method is a fusion of Yoga, Calisthenics, Aerobic as well as Weight Resistance Training, with emphasis on developing strength, power, endurance and flexibility. Zurkhaneh is Persian for House of Power. The word has been adopted to encompass the place, philosophy and system of Persian Yoga & Martial Arts conditioning. It's Holistic - Encompasses the complete range of physical skills as well as practices for mental & spiritual well-being. It's Functional - For ordinary & extraordinary situations. It's Effective - A complete & great workout every time. It's Efficient - Saves time & gets you fitter faster, while having fun using your body in new ways. Functional & Holistic Total Fitness. We offer free workshops, donation based training courses and cost effective seminars and certification programs in Zurkhaneh sports. Zurkhaneh Australia is the only provider of courses and authentic hand made Zurkhaneh equipments such as the Persian Meel and the Shena Push-up board in the southern hemisphere. 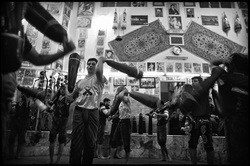 Train to traditional Zurkhaneh music.